Note that this hybrid connects between the Telephone and the Handset, and not between the phone and the wall jack. That way it doesn't matter whether the phone is analog, digital, VoIP or whatever. Item is lightly used and has been tested to confirm that it works fully. The front panel cover plate is missing but this can be ordered from JK Audio should a replacement be required. Most users prefer to have ready access to the level controls so they can adapt to different line conditions. Note that JK Hybrids in my experience operate best with a low level of input signal, so start testing by turning down the Send gain control to the point where just the first LED level indicator is peaking lit. Also the output is on the low side so having the Caller level set to the max is normal when interfacing to balanced downstream equipment. A few nicks and small scratches have been retouched with matching black paint so that the unit looks close to pristine in the rack when seen from a normal viewing distance. The JK Audio PBXport is a professional digital hybrid capable of providing talk show quality caller audio from your PBX phone system. PBXport allows you to send mic or line level signals into your PBX telephone system while maintaining excellent separation between your voice and the caller. The balanced XLR output jack contains only the caller's voice allowing full duplex voice conferencing through the existing PBX phone system without fear of echo and feedback. Talk Show: Connect PBXport between your console and your existing multi-line telephone. Your producer can screen callers from another phone while you take callers on the air by simply selecting available lines on your phone. PBXport provides connections for a microphone, headphones, mixer, telephone handset and your telephone set. Simply disconnect the handset coily cord from the base of your telephone, and connect this handset cord to the front or rear panel jacks on PBXport. Now connect the supplied cord from PBXport to your telephone base. The handset is disconnected when you press the “Online" button, and reconnected when you press the “Handset" button. The Handset Type switch allows PBXport to emulate the type of microphone found in any PBX phone system; electret, dynamic, or carbon handset microphones. Mic/Line pad switch; Line = +5dBu nom. Speaker output: Screw terminal, 8 ohm, 1W max. 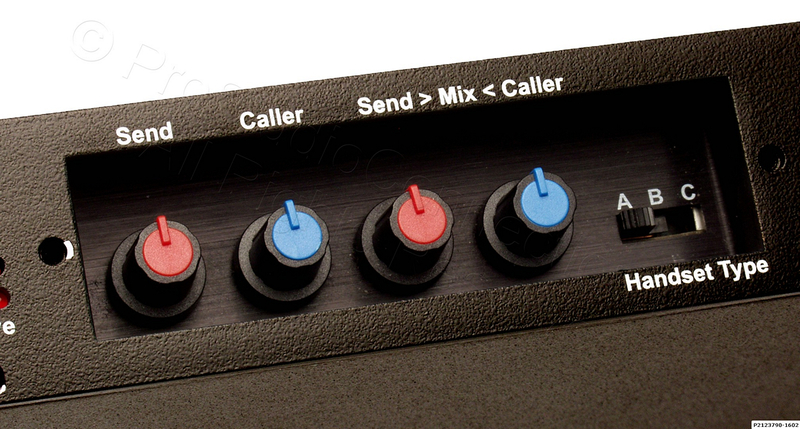 Handset Type: Switch selects electret, dynamic, or carbon handset microphone types.